Tinolang Manok is a kind of Chicken dish which is cooked by sauteing garlic, onions, and ginger the adding Chicken and letting it turn a little brown. Water is used for the broth and Sliced Papaya or Sayote (Chayote) is added as well as malunggay or Dahon ng Sili (Chili Sprouts) before you turn off the stove. Heat oil in a pan, saute garlic, onion, and ginger. Add the chicken and cook, stir for 3 minutes or until chicken juice run clear. Pour the fish sauce, mix occasionally for 2 minutes. Add the chicken broth or the dissolved chicken cube. Uncover and add sayote or papaya, mix and cover for 5 minutes. Let it cook. Add the salt. Stir well and cook for 2 minutes. 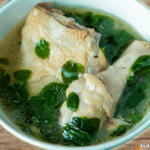 This video shows another recipe for tinolang manok.